From the heart of Chicago, London or online, the Concordia University MBA provides its candidates with more than just an MBA education. With nationally acclaimed faculty, online alternatives for study and an integrated and hands-on curriculum, Concordia graduates are destined for success. The Master of Business Administration at Concordia University Chicago is defined by the business environment as we know it today and its potential in the coming future. Candidates will explore current topics in the business world, business strategy, market studies and key concepts, influencers and measures of business performance. With the goal of educating the next generation of leaders in business, the Concordia MBA program integrates a stream of ethics into all business studies. The relevance of ethical action cannot be underestimated in the contemporary world. This careful integration will prepare Concordia graduates with the current and prospective ethical challenges of doing business and effectively provide an edge over the competition. The faculty members behind the Concordia part-time MBA are among the core benefits of the program. As a nationally esteemed group of business professionals, with varied and impressive professional backgrounds, Concordia instructors and faculty members provide MBA candidates with insight into various industries, essential business knowledge and a network of professional contacts. As a key element of the MBA program, candidates will develop a close working relationship with faculty. At Concordia University Chicago, MBA class sizes are kept to an average of 15 candidates per cohort and in true MBA form, play a critical role in the development of each candidate. Students will complete their entire programs together with other members of their cohort, sharing experiences, exchanging knowledge and building lifelong connections. With a strong bond between peers, learning is enhanced, accelerated and expanded. Beyond the classroom, Concordia University Chicago also provides its MBAs with exclusive networking events with other cohorts and members of the alumni association. The admissions committee of Concordia University Chicago's assesses potential candidates on a rolling basis and looks to academic, professional and personal qualities when selecting candidates. Graduates will receive a Master in Business Administration from Concordia University Chicago. Concordia University Chicago is fully accredited by the Higher Learning Commission, North Central Association. Part-time On-Campus: classes meet each Wednesday evening and all classes are taught in blocks, with one course being taught exclusively until completion. The part-time program can be completed both in Chicago and in London at Concordia's sister campus. Online: all courses are taught entirely online and in intensive blocks. An exploration of interpersonal behavior, in relation to organizational performance: Behavioral science motivations, social perceptions, group decision-making, ethical leadership and multicultural behavior. An introduction to the key concepts of financial accounting: Analysis of a firm's historical, current and prospective financial state and performance, with an emphasis on investment and credit decision. The development and evaluation of brand strategies over the course of a product life: Strategies for introducing and reviving brands, including basic marketing principles of the product, price, promotion, environmental factors and consumer studies. A comprehensive overview of the microeconomic principles of a business and their relevant in the business decision-making process: The law of supply and demand and its relationships to market outcomes and economic determinants of consumption, savings and labor behavior. A basic view of statistical concepts and analytical tools for data-driven decision-making. An introduction to the concepts of frequency, distribution, variation and normal curve correlations with application to business decisions. A look into decision-making, negotiations and ethics: The impact of culture on management strategy, creating value, motivating resources, leading, creating high-performing teams and integrating performance strategy & measures across all business units. The creation and management of money: The function and roles of financial institutions, fiscal and monetary policy and the Federal Reserve System. An analysis of the policies which govern human resource management and organisational design in terms of recruitment, selection hiring, development promotion and incentive-based pay. The Strategic decision-making which surrounds the production and delivery of goods and services: Value-added activities that transform resource into product, process analysis, quality, inventory control, capacity planning and location decisions. An explanation of corporate budgeting, working capital management and financial analysis. Corporate decision-making in relation to complex capital structures and how these decisions impact the incentives of stakeholders. Accounting principles and tools use in decision-making. Why firms adopt activity-based costing and economic value-added and balanced scorecard decision models. Budgeting, cash flow and incremental analysis. The legal environment which impacts all businesses. The legal aspects of business relationships and business agreements. Forms of business organizations, duties of officers and directors, intellectual property, antitrust, contracts, employment relationships, criminal law and debtor-creditor relationships, including bankruptcy. An evaluation of the principles that guide strategic decisions, including game theory, strategic moves, industry analysis, competitive interactions. A recognition of barries to great decision-making, including biases and decision traps. The development of frameworks for scenario analysis and processes for making sound decisions. In the final project, MBA candidates will consolidate their knowledge and apply it to the actual business environment. Candidates will work in teams to solve an actual business challenge for a real company. Graduates of the Concordia University Chicago MBA will gain membership and access to an exclusive group of more than one thousand alumni. In addition to the networking and career advantages of membership to the Concordia Alumni Association, graduates will benefit from the Concordia University Chicago Career Services, including self-assessments, workshops, career planning and internships. Financial aid available for qualified candidates. 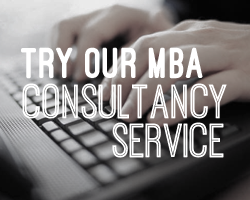 Fill out your details to find out more about Concordia MBA .